I have not even left Spain, and i miss it here already…. not really anticipating it, exceeded my expectations of the place. There are not many places I can say that about!!…. Particularly, if forced to choose anything architecture, the sun, the food and the music. Which are so particular and immutable from this place. …. It feels like I could live that life forever, but then a part of me needs to move forward, forward means going to new york…. headache central. but a necessary place. for work and for other things…. the center in north america of the chess, jazz, tennis and finance world in many respects. I am so tremendously grateful to the Spanish people. For whatever reason, I think they understood me. They saw that i was very artistic, and respected that, and i in them. Almost all Spanish people are artistic in this way. -here, I walked on the beach, and in the small streets. -learned to feed myself, and prepare food. -rode the trains, and saw the countryside, where hill after hill of oranges or vineyards for the wines. 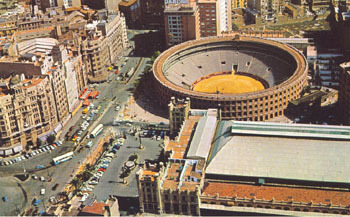 -should have gone to the bullfight,, the bullring is maybe less 3 minutes walk from my house..
first time, and became an afficianado.